and….we’re back. well, we’re trying to be anyways. i know it’s been a while, but life got a little hectic. a resolution of mine in the new year is to get back to my hobbies that have all been left on a back burner for the past few months. i realize our last post made it seem as though we were done blogging….but that’s not true. we’re still here and we may be separated but by no means does that mean we’re done baking and blogging. birthday seasons always seem to bring me back to my senses. 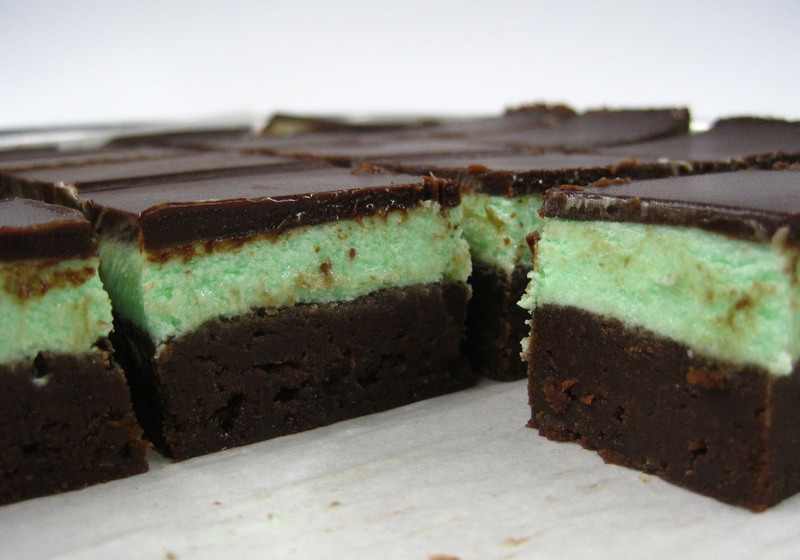 thanks to ricky….i got back into the kitchen to combine two of my favorite flavors….chocolate and mint. maybe it’s cause i haven’t baked in so long…..or maybe these little buddies were truly inspiring…but these brownies quickly moved into the top 5 ranking as far as lazy bird treats go. i say they are worth your time…..i say they were so good i had to set aside weight watchers points (6 points, btw) to eat one every day until they were gone….but that’s just me. whisk together flour, salt and cocoa powder in a medium sized bowl. set aside. using a double boiler (or something resembling one, in my case) melt your chocolate and butter until smooth and glossy. turn off your heat source but leave your boiler in place and add in your sugars (white and brown). whisk until sugars are completely combined. remove from heat and let mixture come to room temperature. fold in your flour/cocoa/salt mixture until the wet ingredients have absorbed the dry. pour your batter into the glass pan you’ve already prepared. bake for 12-15 minutes, rotating halfway through baking time. try your hardest not to overbake these little buddies. test your brownies about a minute or two before your bake time is complete and if your toothpick comes out with a few more flecks of brownie than you’re comfortable with…don’t fret. fight your instincts and take them out a smidge early. they will continue to bake through on your counter as they cool down and taking them out early ensures a yummy gooey brownie. mmmmmm. while your brownies are cooling lets get the buttercream going. in your stand mixer beat your butter and powdered sugar on a medium-ish speed till it’s nice and fluffy. add in creme de menthe, peppermint extract, and milk and continue beating till mixed in. if you need to add in more sugar for consistency sake…feel free. spread the buttercream over the brownies – smoothing with a rubber spatula and transfer to fridge for some chillin time. 45 minutes should do the trick. time for the glaze. double broiler time again. combine your chocolate, corn syrup, and butter in a heat safe bowl over a saucepan of simmering water. whisk it up until your chocolate is silky smooth. remove from heat and whisk like crazy for about a minute so release excess heat. pour melted chocolate over your chilled brownies and butter cream. spread the glaze, with an offset spatula to create an even layer from edge to edge of your brownies. transfer back to fridge for about an hour or until the glaze hardens. remove pan from fridge and wait about 15 minutes for your glaze to soften slightly. remove the brownies from their pan by gently pulling up on the excess parchment paper. (this is why you went a little nuts with the butter in the first place) cut brownies into squares using a warm knife. for nice clean cuts, run your knife under hot water – dry off, make the cut, and repeat. serve immediately. brownies are best cold…mmmm…memories.